Wednesday’s mid-season Mountain Valley Conference meet at UMA gives everybody an idea of the upcoming championship. Hall-Dale’s Jon Whitcomb, center, pulls ahead of Madison’s Serek Paine, left, and Winthrop’s Jesse Stevens during the 4th Annual Mountain Valley Conference Mid-Season Meet on Wednesday at the University of Maine at Augusta. AUGUSTA — The high school cross country regular season passes by in a blur, which leaves little time for runners and coaches to look at the bigger picture. Which is why a meet like the 4th Annual Mountain Valley Conference Mid-Season Meet at the University of Maine at Augusta on Wednesday is a favorite for many. It brings the conference into sharper focus. Minus about three weeks of training and likely a few degrees in temperature, the meet simulates the conference championship meet, which will be held Oct. 18 on the same UMA course. Allen and Emma Wilson of Hall-Dale showed the rest of the MVC what they’re up against, winning the boys and girls races, respectively. 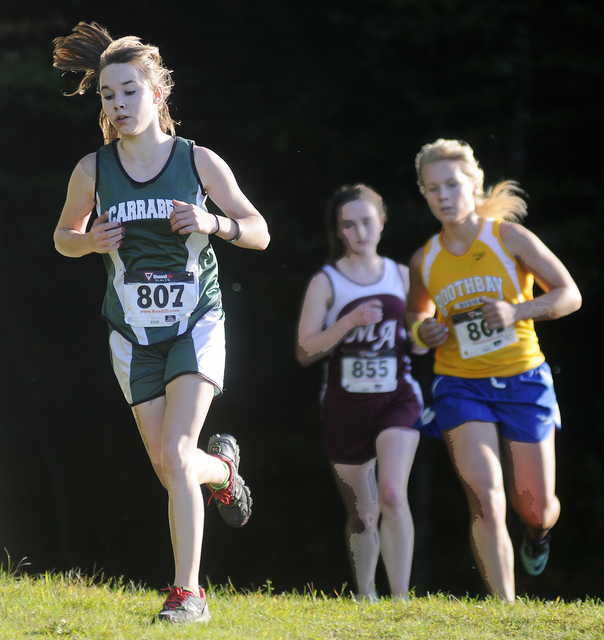 The Boothbay boys and St. Dominic girls won the team titles. Allen, a senior, let others set the pace early but emerged from the woods with a comfortable lead for the final 500 meters and finished the 5-kilometer course in 17:23, six seconds ahead of runner-up Nicholas Harriman of Lisbon. 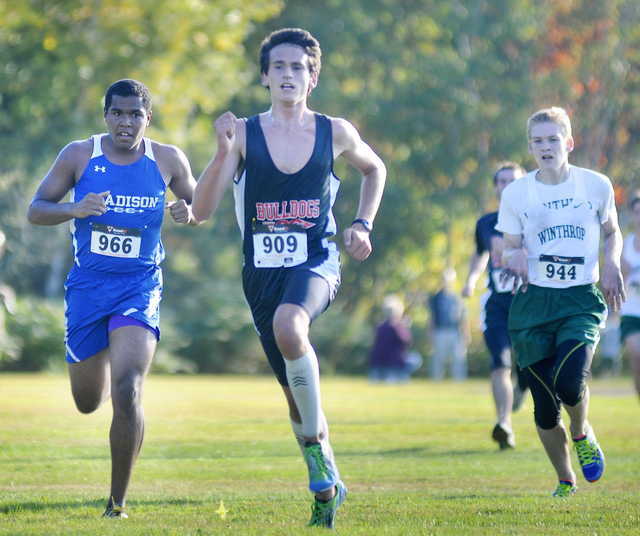 Joey Paolillo of Boothbay finished third, followed by Monmouth’s Luke Thombs. 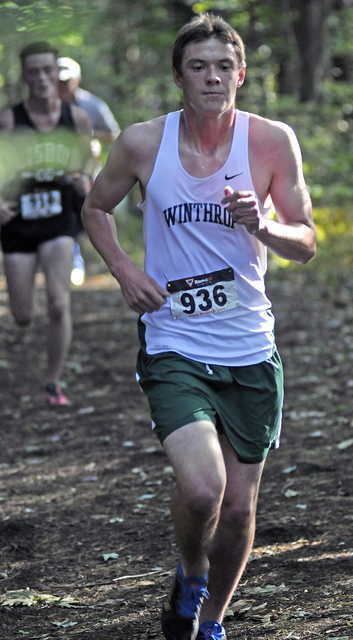 Chris Pomerleau of Hall-Dale (eighth) and Jacob Hickey of Winthrop (10th) also cracked the top 10. Boothbay packed five runners in the top eight to post the boys low score (26) going away. Winthrop (63) was second, Lisbon third. Hall-Dale and Madison rounded out the top five. No one could close the gap on Wilson, who led throughout and broke the tape at 21:29, 13 seconds ahead of runner-up Hannah Morley of Boothbay. Ella Brown of St. Dom’s was third. Madison’s Olivia Demcheck (sixth) and Monmouth’s Carey Knowles (seventh) and Ashleigh Hartford (10th) finished in the top 10. St. Dom’s placed four in the top seven to beat Monmouth, 38-59, for the girls team title. Boothbay, Hall-Dale and Dirigo rounded out the top five. 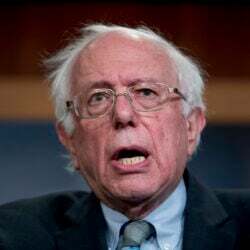 “We’ve got a lot of work to do,” he added. The Mustangs have a little over three weeks to get that work done if they hope to catch the Saints at the conference championship. Wednesday’s meet gave Menendez, and all of the other coaches in the conference, a better idea of what needs tinkering in the interim.